Change a child's life through mindfulness practice. ​To empower youth through yoga, nutrition, and optimistic teachings that help to develop life skills that can: enable youth to take responsibility for their life, develop respect for themselves and others, and have confidence in their own potential. CALM Kids training for schoolteacher and professionals working with children. 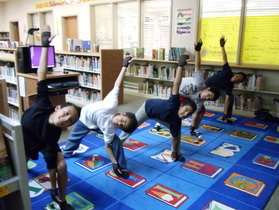 "Yoga has given them a common source of interest allowing them to practice and improve their social skills and build friendships they did not have before." "Through the practice of yoga, meditation, and breathing the students have been given another tool to help them cope with poverty, violence, drug use, gang activity and all the other pressures of a teenage life." "A program that students were once very skeptic about has become a much valued and pursued program by many Torch students. It is evident that the program has enriched the lives of participating students through yoga."